The Presidential MiterPP (plywood panel) door is one of our most popular ever. The heavily detailed bead gives the door the look of an applied molding an looks fantastic with glaze. Because the Presidential in its mortise and tenon version is quite expensive, many customers opt for this version featuring a mitered joint and flat 1/4″ veneered center panel. 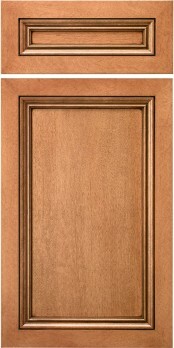 It is interesting to note that the presidential is one of the few doors that is less expensive in its mitered version.